After a months searching and researching to create simple and clean backup strategy, i found cool and simple solution for backing up from windows 7 (64 bit) to Linux server running Rsync server, and here's my backup startegy. 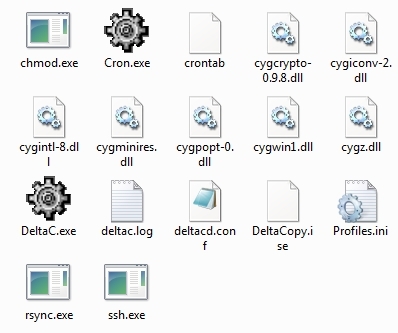 In general terms, DeltaCopy is an open source, fast incremental backup program. Let's say you have to backup one file that is 500 MB every night. A normal file copy would copy the entire file even if a few bytes have changed. DeltaCopy, on the other hand, would only copy the part of file that has actually been modified. This reduces the data transfer to just a small fraction of 500 MB saving time and network bandwidth. I used only client software because i don't want to running backup server on windows. Cron scans the file CRONTAB every minute and checks every line if the specified time/date information matches the current time/date. If they are equal, the command line specified will be executed. A log file (cron.log) with the executed commands is written to the current directory. After combining all of that aplication, i got this usefull aplication.